I had a new boiler installed in April last year as the previous one was pretty much kaput. I had one of the allegedly energy efficient condenser boilers installed as per current requirements. As you can see, my energy usage in the subsequent twelve months was down by a magnificent 6.676%. Not quite the huge savings I had been led to expect but better than a poke in the eye I suppose. But then I got to thinking: the post Christmas period this year was a lot milder than last year so the heating was on a lot less anyway. 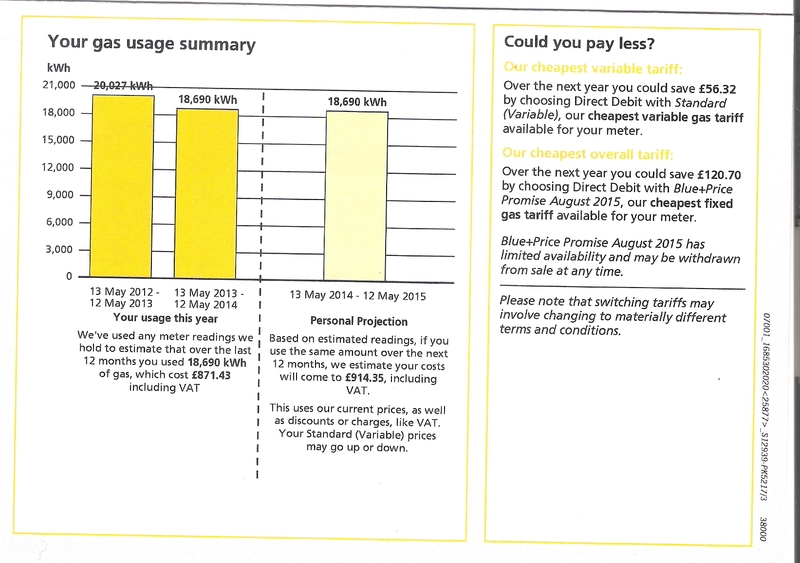 How much of the saving was due to that rather than the much hyped efficiency of the new boiler. I suppose I’ll find out the next cold winter we have. This entry was posted on August 11, 2014 at 3:45 pm and is filed under economics, Energy, Global Warming. You can follow any responses to this entry through the RSS 2.0 feed. You can leave a response, or trackback from your own site.